I'm just going to jump right in and start firing off posts about all the FOs that I haven't talked about yet. First up: project #3 for 12 in 2011 is done! They were actually finished mid-March but didn't get around to taking photos of them for the longest time. In my last post about these socks I had mentioned gauge/needle size issues and how I was a bit worried that these would turn out either really big or insanely snug. Guess what? They fit perfectly! Size 2.25mm needles seem to be the magic needle size for sock making! I was also worried that I would run out of yarn too soon since the yardage for BMFA's Socks That Rock which I still love and will be hoarding like a mofo!) is a fair bit shorter than what I'm used to. A lot of sock yarn that I've knit with in the past had at least 400yds. Well, I ended up with about 10 grams leftover (yes, I weighed it) and could have made the foot on both socks a smidge longer. For some reason I always start decreasing for the toes too soon and my socks end up a little on the smaller side. I'm hoping that over time the socks will stretch out a little and solve the problem. One thing I'm proud of with these socks? The heels. It was my first time knitting a heel flap - something that I've been really intimidated to do for the longest time, and yet they were insanely easy to knit! Even the picking up of the stitches and knitting the gusset was easy peasy. Why was I so scared to do this in the first place? I'm quite proud of my heels and am really loving how they look. 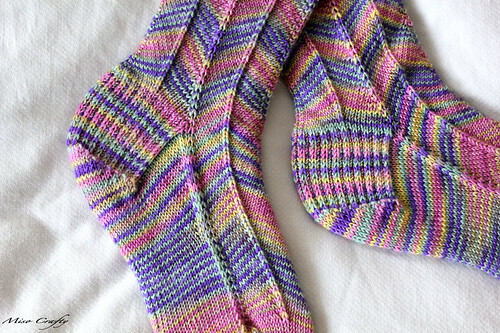 I did a slip stitch heel this time around, but plan on doing all the different variations of heels on future socks. Those are so cute! 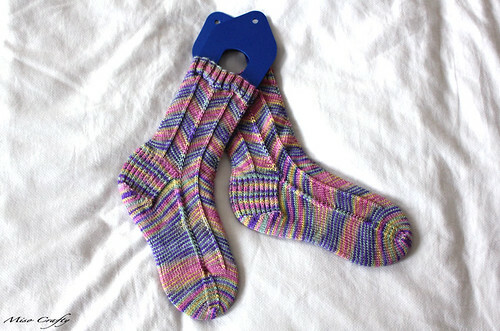 For some reason I love knitting things that used to be insanely popular (Jaywalker, Shetland Triangle, etc.) fashionably late. Sadly, my feet are just too big for Jaywalkers, but I still like to admire other people's. Thanks Cory! :) I usually find myself behind on the knitty trends too...by a long shot! I think a lot of this has to do with being such a slow knitter.